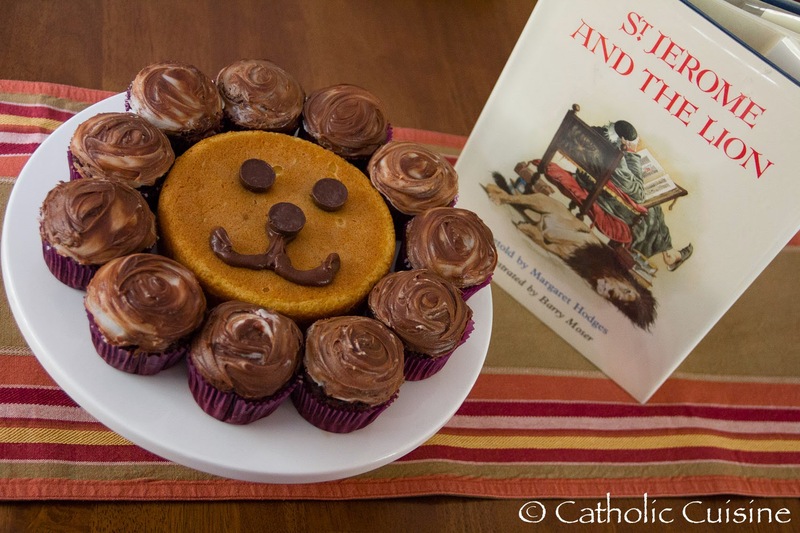 Every year on September 30th my children pull our copy of St. Jerome and the Lion off the bookshelf. This book is currently out of print, but you may be able to find a copy at the library! Cay Gibson has an excellent study guide to go along with it in her book Catholic Mosaic. If you'd like to be entered to win a copy of Catholic Mosaic, hop on over to my other blog, Shower of Roses, and leave a comment! 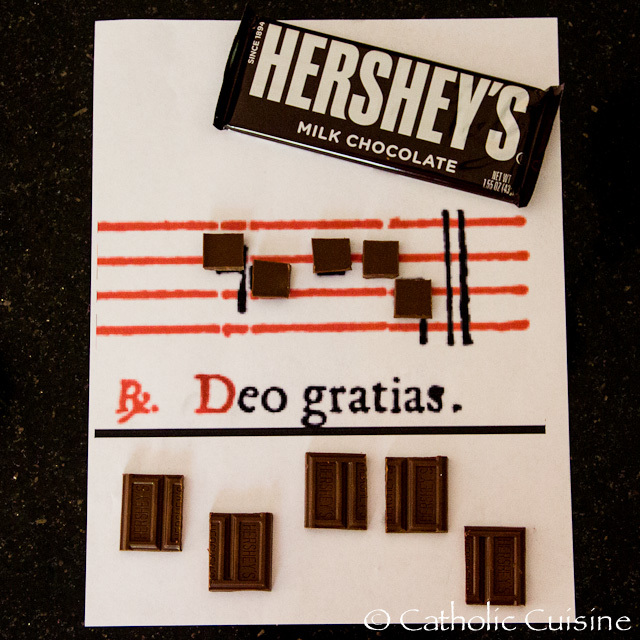 Happy Feast of St. Jerome! 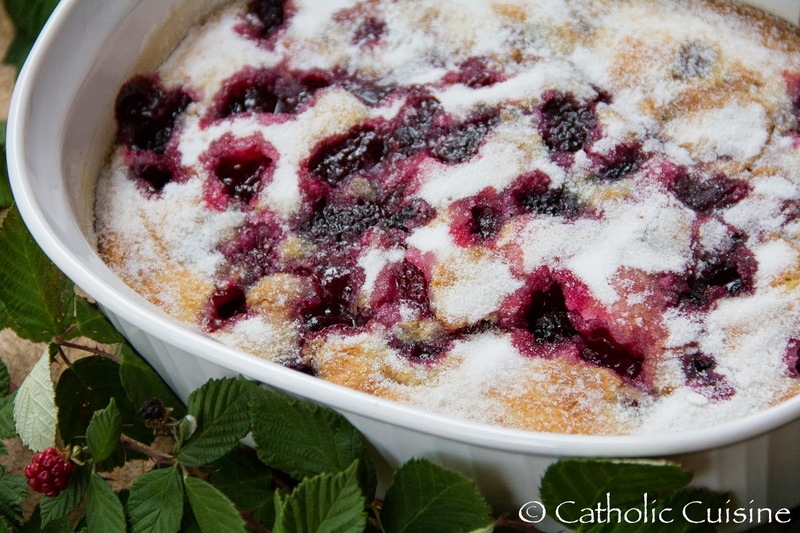 According to tradition (and Joanna Bogle in her Book of Feasts and Seasons) "blackberries are no good to eat after September 29th because 'the Devil spat on them when he was cast out of Heaven into Hell on Michaelmas'!" 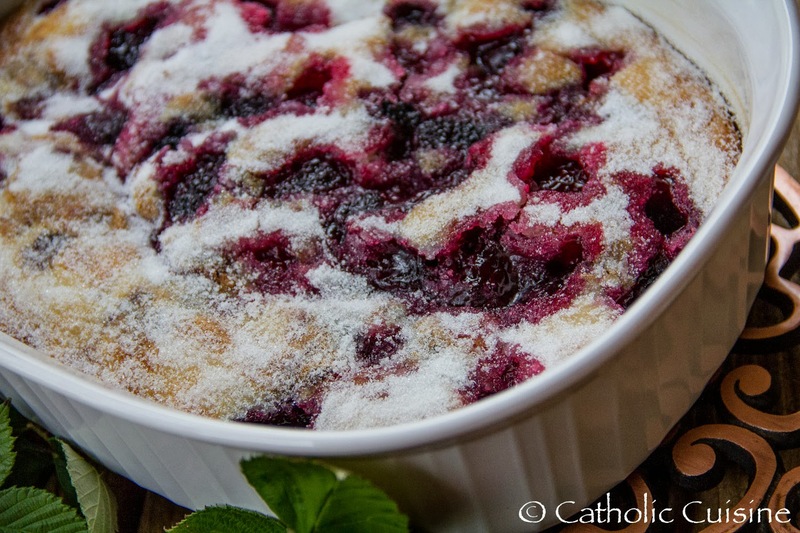 Here is an easy recipe for the Blackberry Cobbler I served my family today. It was delicious! Preheat the oven to 350 degrees F. Grease a 3-quart baking dish with butter. 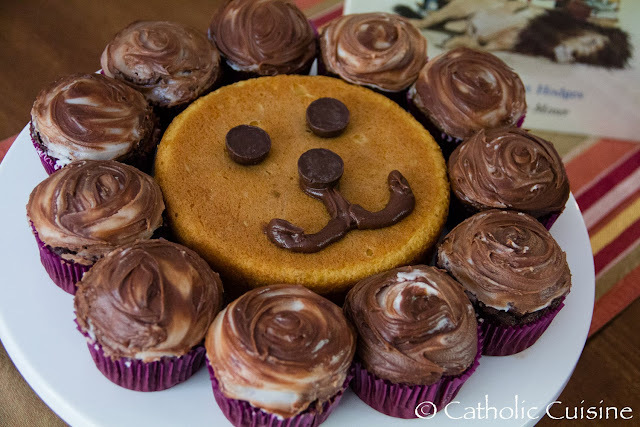 In a medium bowl, whisk together 1 cup of the sugar, flour, baking powder and salt. 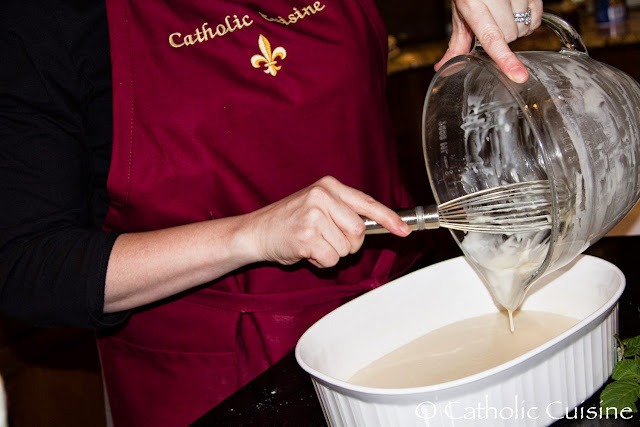 Whisk in the milk and melted butter. Pour the batter into the baking dish. 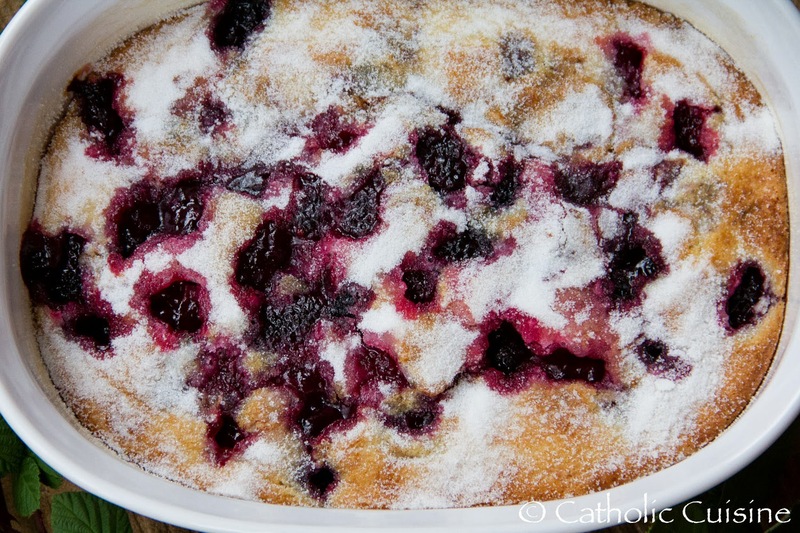 Sprinkle the blackberries evenly over the top of the batter. Sprinkle 1/4 cup sugar over the blackberries. Bake for one hour, until golden brown and bubbly. Ten minutes before the cobbler comes out of the oven, sprinkle the remaining 2 tablespoons of sugar over the top. Mary Undoer of Knots (also Untier of Knots) is a title of Mary derived from a 1700 painting by Johann Schmittdner. The image, called Maria Knotenlöserin in German, is located in St Peter am Perlach church in Augsburg, Germany. Earliest reference to Mary using the image of untying knots is in an ancient text of St. Ireneus in the late 2nd century. He wrote "the knot of Eve's disobedience was loosed by Mary's obedience." "For what the virgin Eve had bound fast through unbelief, this did the virgin Mary set free through faith." (Adversus haereses, 3, 22). This is one of the earliest examples of describing Mary as the New Eve. We see here the beginnings of the devotion to Our Lady, Untier of Knots. 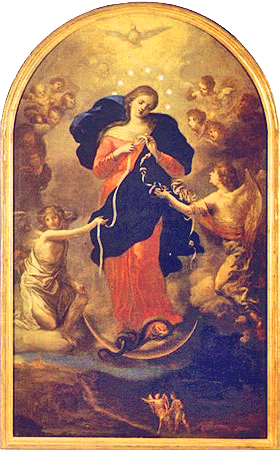 The painting depicting Our Lady untying the knots of a white wedding ribbon was commissioned around 1700 by Fr. Hieronymus Ambrosius Langenmantel in thanksgiving for her intervention in his family. The history and story of that intervention can be found her at the website of the International Fraternity of the Virgin Mary Untier of Knots. In the lower portion of the painting, Wolfgang Langenmantel can be seen being guided by the Archangel St. Raphael in his journey to resolve the crisis in his marriage. 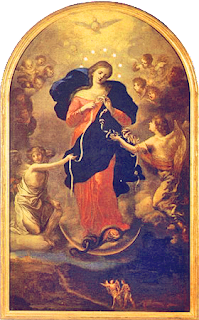 The advocation of Mary, Untier of Knots, has become widespread and efficacious particularly in the resolution of marital and family conflicts. 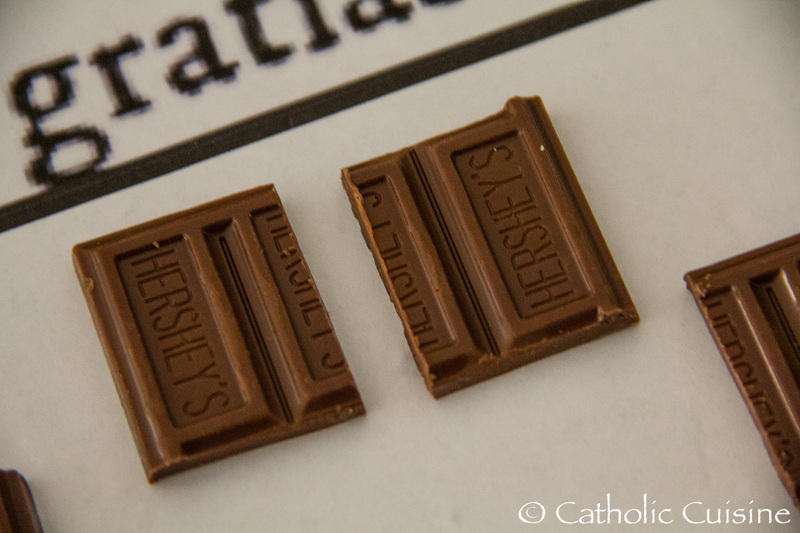 Pope Francis has a special devotion to this image and is responsible for bringing it to Argentina and other parts of South America where it is highly regarded. Because of this we are seeing more and more about Our Lady under this title and understanding her intercession in struggles of family life and marriage. It is a beautiful image. Since it is an image that may be new to many this it would be a great year to spend some time focusing on learning more about it and introducing your family to the devotion. The feast days listed for this title of Mary are of course August 15 and December 8 which cover her under many different titles. September 28 is also listed as a day to commemorate her under this title - sources indicate that is the date of the intervention in the Langenmantel family. It also seems symbolic that there is a connection to St. Raphael and the archangels whose feast is the day following. With St. Raphael being pictured and the image associated with healing of marriage struggles it is that Raphael/marriage connection. The visual of a knots being untied is so sensory and physical. There are many great menu or treat ideas that you could easily incorporate into your day. Bread Knots come to mind as very fitting and easy to do. Whether you make them from scratch or use a prepared refrigerator dough. The two classics are garlic knots and cinnamon knots. Cinnamon knots would be a fun option for a breakfast or brunch while the garlic knots seem more suited to lunch or dinner. String Cheese Knots is a fun snack idea that can easily be achieved by using the longer skinny cheese sticks or taking some "strings" from a packaged cheese stick and tying it in a knot. Licorice Knots are another sting-like food that can be tied in a knot, and untied too, making it a fun and interactive treat for the day. The thin string licorice works well but the thicker is fine too. There are even blue flavors available that make this even more fitting as a remembrance of our lady in blue. Pretzels or pretzel styled snacks are an easy and ready made "knot" to pull out to remember Our Lady today. The prayer to Our Lady Undoer of Knots, written by our Holy Father Pope Francis, when he was a bishop in Argentina. 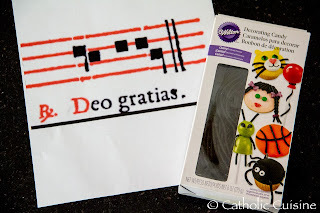 Deo Gratias. ~ Thanks be to God. Today is the feast of the Exaltation of the Holy Cross and the 6th anniversary of Summorum Pontificum going into effect. Father Z suggests that we all "say a prayer for Benedict XVI and thank God for this important gift to the people of God." 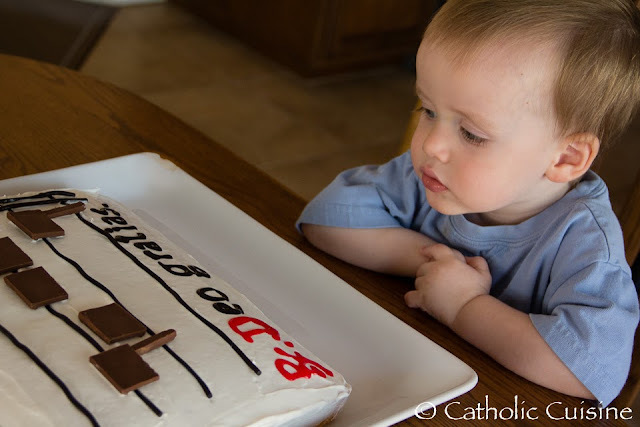 He also suggests that we "find some way to celebrate on this beautiful feast day and anniversary. 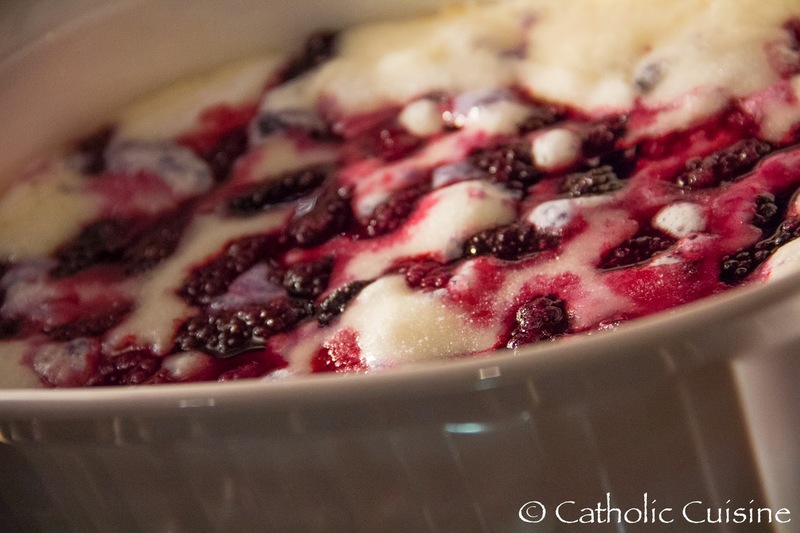 We have a lot to be thankful for, both in the way of the Holy Cross and in how we renew the Sacrifice of the Cross during celebrations of Mass with the traditional Roman Rite." 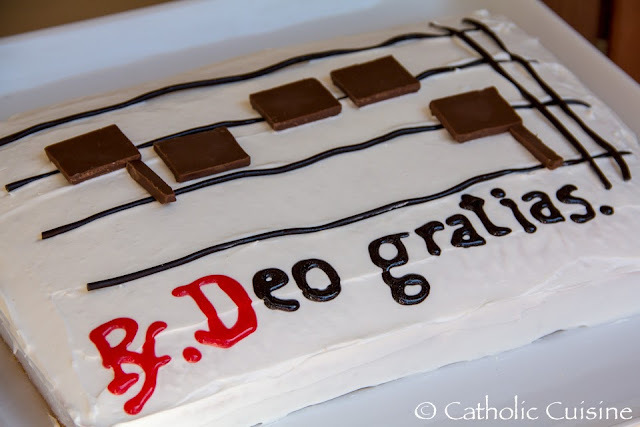 So, I baked a cake and decorated it with "Deo gratias." at the suggestion of my husband. After dinner we plan to share a beautiful and inspiring out-of-print book with our children and celebrate this feast and anniversary with cake! Almighty God and Father, Who have revealed Yourself through Your Eternal Word, and have blessed Your Church with Pope Benedict XVI, our teacher in both faith and reason; receive our prayers of thanksgiving for his witness to the beauty of truth, for his example of hopefulness, for his humble service of Christ's Bride. Grant him, in his time of retirement, the reward of study and prayer as he continues to seek, find, and love you in truth. We ask this through Christ our Lord.